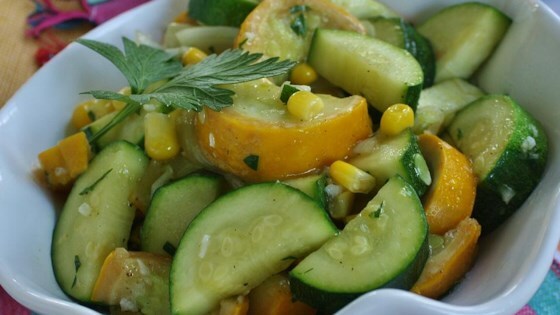 "A delicious and different way serve two favorite summer vegetables, squash and corn!" Heat the oil in a skillet over medium-high heat, and cook the onion and garlic until slightly tender. Mix in the vegetable broth and corn kernels, and cook until heated through. Mix in the squash and zucchini. Cover, and continue cooking 10 minutes, stirring occasionally, until squash and zucchini are tender. Mix the parsley and butter into the skillet with the squash. Season with salt and pepper. Cook and stir until butter is melted, and serve hot. I made this recipe into a full meal. I added sliced kielbasa, and served it over yellow rice. It was DELICIOUS and all dozen people at the dinner loved it. Not a drop was left over.